Published by the French organisation HorsLesMurs, Stradda is a quarterly French-language magazine dedicated to circus and street arts. This English edition draws together a selection of articles from Straddas past and from (HorsLesMurs sub-organisation) Circostrada's regular online dossiers, plus adds a few new articles to the mix. 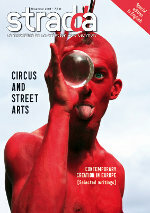 In reflecting HorsLesMurs' role in developing the circus / street arts infrastructure as well as engaging audiences, the articles are split between industry-led pieces about e.g. EU policy's impact on European festivals, and then, on the other hand, artist-led pieces profiling companies or arguing for aesthetic readings. Best in this edition are Tomi Purovaara's informative overview of the rich Scandinavian circus scene (providing lots of leads to follow), and Thomas Ferrand's portrait of the transgender artist Philippe Ménard, with a particular focus on her work with ice for P.P.P.